This will be a great opportunity to grow in our faith and learn more about who God is, while at the same time refining one another by sharing wisdom! 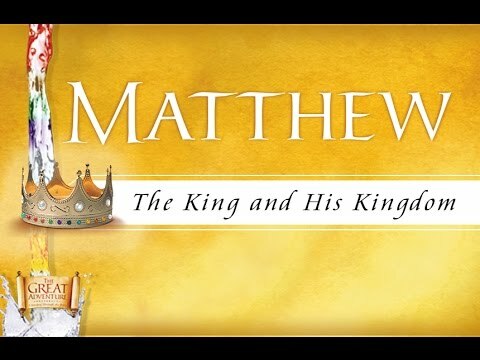 This study is going to be centered around a DVD series which covers the Gospel of Matthew, "The King and His Kingdom," with books provided and discussion regarding the evening topic. You can read a little more about what to expect here. This is an ongoing Catholic study through the book of Matthew with Jeff Cavins. It takes a wonderfully in-depth, historical and cultural look at this gospel, exploring the Jewish roots of our faith as well as the significance of geology and ties between the Old Testament and the New. Everyone is invited to join us! We will meet at "The Well," which is a small house next to the church. The entrance is off Taylor May Road; you'll pull into the driveway and come in the door around the corner of the house and up the stairs. Bring a bible and a Catechism, if you have one! Hope you see you there! Feel free to share the invite!